For three generations, Standard Chair of Gardner has been dedicated to producing chairs of uncompromising and unequalled quality. Our experience and commitment to quality can be seen in the fine craftsmanship and attention to detail in each and every child rocking chair we make. 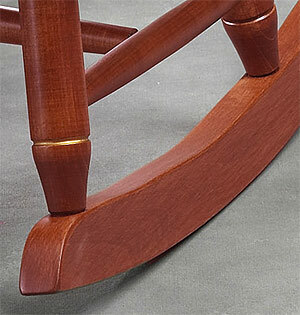 All Standard Chairs are crafted of solid maple hardwoods that have been kiln-dried. No veneers or other woods are used. All parts are finely hand-sanded, stained and lacquered. And each chair is carefully and continuously inspected to be sure it meets our exacting standard of quality. At the top of the child rocking chair, there is a steam bent crown that is designed to show off the seal and one-of-a-kind personalization. It also provides a comfortable support for the upper back. The turning tenons, which are at the ends of spindles and legs, have been compressed so that when inserted into the seat holes the turnings expand and create joints which are strong and long-lasting. The seats themselves are all scooped for comfort and, for added comfort especially at a desk, the seats of the Standard Chairs are deeply saddled as well. From the carefully crafted runners to the careful gold beading of the turnings to the finely engraved lines on the crown…the chairs are truly American craftsmanship at its best. The result is a work of unique and lasting beauty. The perfect gift for a child you love. A chair they can remember you by all the days of their life. Truly a work of heirloom quality.